The South Shetland Islands and Antarctic Peninsula form one of the most spectacular wilderness areas on Earth. A remarkable collection of wildlife lives in the shadow of snow-capped mountains and blue icebergs; penguins, whales and a rich diversity of birdlife await you an this exploratory journey into the Great White Continent. Embark the MV Ushuaia in the afternoon and meet your expedition crew and lecture staff. 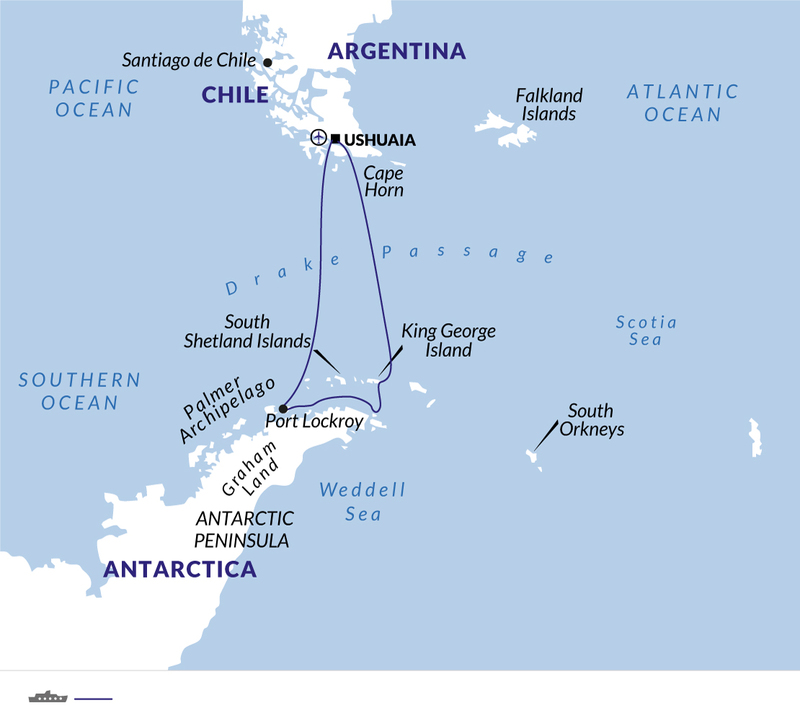 After you have settled into your cabins, we sail along the famous Beagle Channel and the scenic Mackinlay Pass. Named after the renowned explorer, Sir Francis Drake, who sailed these waters in 1578, the Drake Passage also marks the Antarctic Convergence, a biological barrier where cold polar water sinks beneath the warmer northern waters. This creates a great upwelling of nutrients, which sustains the biodiversity of this region. The Drake Passage also marks the northern limit of many Antarctic seabirds. As we sail cross the passage, our lecturers will be out with you on deck to help you spot the amazing variety of seabirds found in these parts, including many albatrosses which follow in our wake. The MV Ushuaia's open bridge policy allows you to join our officers on the bridge and learn about navigation, watch for whales, and enjoy the view. A full program of lectures will be offered as well. The first sightings of icebergs and snow-capped mountains indicate that we have reached the South Shetland Islands, a group of twenty islands and islets first sighted in February 1819 by Capt. William Smith of the brig Williams. With favourable conditions in the Drake Passage, our lecturers and naturalists will accompany you ashore today as you experience your first encounter with the penguins and seals.The South Shetland Islands are a haven for wildlife;- vast penguin rookeries, beaches ruled by Antarctic fur seals and Southern elephant seals, make every day spent in this amazing island group unforgettable. Sailing through the narrow passage into the flooded caldera of Deception Island is truly amazing. King George Island, the largest of the South Shetland Islands, features colonies of nesting Adélie and Chinstrap Penguins, Kelp Gulls, Blue-eyed Cormorants, Antarctic Terns and Southern Giant Petrels and is also home to scientific bases of many different countries. Macaroni, Chinstrap and Gentoo Penguins, as well as elephant seals await you at Livingston Island, where we also hope to make a landing. The Peninsula's remarkable history will provide you with the excitement experienced by the early explorers. You will have plenty of time to explore its amazing scenery, a pristine wilderness of snow, ice, mountains and waterways and an incredible variety of wildlife. Apart from penguins and seabirds, you are very likely to see Weddell, crabeater and leopard seals as well as Minke, killer (orca) and humpback whales at close range. We hope to navigate some of the most beautiful waterways - depending on the ice conditions - the Gerlache Strait, the Neumayer Channel, and the Lemaire Channel. The latter, are narrow passages between towering rock faces and spectacular glaciers. We plan to make at least two landings per day and possible landing sites may include Paradise Bay - perhaps the most aptly named place in the world ! We will also attempt a landing on the continent proper. After negotiating the iceberg-strewn waters of the Antarctic Sound, we hope to visit the bustling Adélie Penguin (over 100,000 pairs breed here) and Blue-eyed Cormorant colonies on Paulet Island. The Nordenskjöld expedition built a stone survival hut here in 1903. Today its ruins have been taken over by nesting penguins. Further exploration may take you to Melchior Island, Cuverville Island, Portal Point and Neko Harbour. We leave Antarctica and head north across the Drake Passage. Join our lecturers and naturalists on deck, as we search for seabirds and whales and enjoy some final lectures. Take the chance to relax and reflect on the fascinating adventures of the past days on the way back to Ushuaia. We arrive at the port of Ushuaia in the early morning and disembark the MV Ushuaia after breakfast. Some cabins are equipped with a hairdryer. Hairdryers can also be borrowed from the Hotel Manager on the ship. with you; only limited can be borrowed onboard. Tipping is collected at the end of the voyage and is divided among the crew. You will receive detailed guidelines aboard. Tipping is a very personal matter and the amount you wish to give is at your discretion, but as a generally guideline, we suggest US$15 per person per day. Built for the US agency NOAA (National Oceanographic & Atmospheric Administration), the M/V Ushuaia has been constantly modernised and refurbished whilst operating in Antarctica. The M/V Ushuaia is an ice-strengthened small ship, accommodating just 88 passengers; making it a comfortable and steadfast choice. Knowledgeable staff will ensure you get the most out of your visit and there's an open bridge policy plus ample deck space for wildlife-viewing. Prices are based on outside facing, triple cabins on the lower deck. Triple cabins have three lower berths, with private facilities and have either a window or portholes. The MV Ushuaia has a number of different cabin categories, all with en-suite facilities, with two beds and a porthole (some suites have double beds.) Cabins are all outside facing and will either have portholes or windows. Most cabins are twin share, although there are two dedicated single cabins on board. We can also offer single occupancy on most cabin types, at a supplement cost. Call us for details on the cabin choice to fit your requirements. On-board the expedition ship all meals are included in the price of your expedition; an American-style and continental breakfast, buffet lunch and three-course dinner. The dining room accommodates all guests in one sitting and it's free seating. Vegetarians and some special dietary requirements can be accommodated with advance notice, please advise us at time of confirmation. Coffee and tea are provided free of charge. All other beverages, alcoholic and non-alcoholic, are not included and can be purchased in the bar. Information The ship will aim to arrive at 7 a.m. on the date of arrival and disembarkation normally commences between 8.00-8.30 am. We recommend that you book an afternoon flight out of Ushuaia to allow for any delays.